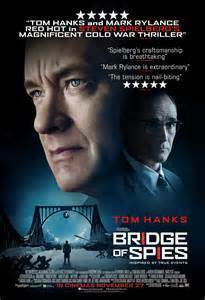 Steven Spielberg and Tom Hanks, in their 4th collaboration, have made a good, winning film in “Bridge of Spies”. Sort of a nod to a Frank Capra/James Stewart movie with humor, in a serious situation, and Hanks being the All American Everyman. This Cold War spy story based on a true story of an exchange between an American pilot, Francis Gary Powers played by Austin Stowell shot down and accused of being a spy and Rudolf Abel, a communist spy, played by Mark Rylance, who is caught in New York. Hanks is a family man with a dutiful wife, played by Amy Ryan, a son and two daughters, and a successful insurance lawyer. He has a deep and abiding belief in the United States constitution for all, including arrested spies. remember the lawyer James Donovan, Rudolf Abel or an American Yale student Frederic Pryor, played by Will Rogers, who was another part of the equation. Whether you know the story, the history or what liberties Spielberg and the screenwriters Matt Charman, Ethan and Joel Coen, take it becomes a taunt thriller that will have you hanging on to every word and action. The acting, from Hanks, Rogers, Stowell, Ryan along with Alan Alda, Dakin Matthews, Scott Shepherd, Sebastian Koch, Domenick Lombardozzi and others, is strong but it is Mark Rylance as the Russian spy who dominates every scene he is in with a quiet, subtle performance that will win many people to his side. Spielberg does the fine job that is expected of him but this film cries out to have been filmed in black and white and the scene of the airplane crash just doesn’t ring true. At two hours and 15 minutes the movie could have been shorter if it ended on the bridge of spies but stay for the credits to find out what happened to the people involved as it will bring you some surprises, especially regarding Donovan and Powers or at least it did for me. The production values are top notch as is expected from any film Spielberg and Hanks are involved in.